The return of one of 2018’s breakout stars will take place this weekend when Mexico’s Jaime Munguia (31-0, 26 KOs) attempts to make the third successful title defense of his WBO super welterweight championship against Japan’s Takeshi Inoue (13-0, 7 KOs). Munguia was first heard of by a majority of boxing fans last year as a potential opponent for former middleweight champion Gennady Golovkin. Golovkin ended up facing Vanes Martirosyan instead when the Nevada Athletic Commission did not approve Munguia due to his young age and lack of experience of fighting in the middleweight division. It may have been a blessing in disguise for the 22-year old Munguia as he instead went on to face Brooklyn’s Sadam Ali for the WBO super welterweight title. The Brooklyn, New York native, was coming off of the most significant victory of his career in defeating future Hall-of-Famer Miguel Cotto by decision in Madison Square Garden. Munguia was not intimidated by Ali and made quick work of him scoring two knockdowns in the first round and two more in rounds two and four en route to a dominating fourth-round stoppage. After the bout with Ali, Munguia made a quick return in July 2018 when he faced former super welterweight champion, Liam Smith. Once again Munguia dominated his opponent dropping him in the sixth round to win a clear unanimous decision victory. Against Smith, the young Mexican showed that not only does he pack a punch, but has the ability to go a full twelve rounds. Following the fight with Smith, Munguia faced Brandon Cook on the undercard of Golovkin’s rematch with Saul Alvarez in September 2018. The fight only lasted three rounds with Munguia proving his superiority from the sound of the first bell. Munguia’s opponent on Saturday is undefeated and seven years his senior. Inoue will be fighting for the first time in the United States and only his second fight outside of his native Japan. He is relatively unknown outside of Japan making him a mystery for many boxing fans. The odds are heavily against Inoue to defeat Munguia; however, bigger upsets have taken place in the sport. Japan has seen a recent influx of great fighters such as bantamweight champion Naoya Inoue, flyweight champion Kosei Tanaka and super featherweight champion Masayuki Ito. Against Munguia, Inoue will look to place himself on the list of the latest set of Japanese world champions. 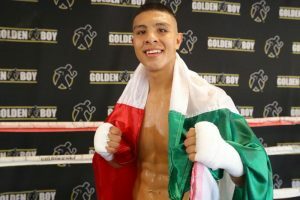 Munguia will look to add another title defense to his ledger. Unfortunately for Munguia, he may be on the wrong side of the fence in his division with the majority of the champions falling under the Premier Boxing banner. The young Mexican’s goal is to one day step in the ring with Canelo Alvarez. Should he continue winning, it is a possibility that the fight can take place in the near future. The two men are both promoted by Golden Boy Promotions. The broadcast’s co-main event will feature “regular” WBA featherweight champion Jesus Rojas (26-2-2, 19 KOs) taking on China’s Can “Monster” Xu (15-2, 2 KOs). Rojas is coming off a unanimous decision loss to Joseph Diaz. Rojas was able to keep his title per WBA rules due to Diaz not making the featherweight weight limit of 126 pounds. The Puerto Rican won the title against the Dominican Republic’s Claudio Marrero scoring a seventh-round knockout in Las Vegas the day before the first encounter between Canelo Alvarez and Gennady Golovkin. Rojas’ opponent is also unknown in the United States having fought a vast majority of his fights in China. Xu will be making his second appearance in the U.S. and holds some physical advantages over Rojas. Xu is 24 years of age making him eight years younger than the Puerto Rican (32). The Chinese fighter also has the edge in height and reach. It has been shown that Rojas can be outboxed. With just two knockouts in 17 professional bouts, it is likely going to be the game plan for Xu to use lateral movement to offset any of Rojas’ oncoming attacks. On paper, the card in Houston looks to be one to showcase two world champions who will go on to bigger and better things. However, boxing matches are not fought on paper they are fought in the ring. The card will begin at 5 pm ET on Saturday, January 26, 2019, on the DAZN streaming app. The post Jaime Munguia Set to Return Against Takeshi Inoue appeared first on BoxingInsider.com. Is Julian Edelman the best postseason wide receiver since Jerry Rice?